Available in vinyl or a 40-year tested pressure treated and double kiln dried Southern Yellow Pine. Comes in octagon, rectangle, and oval shapes. 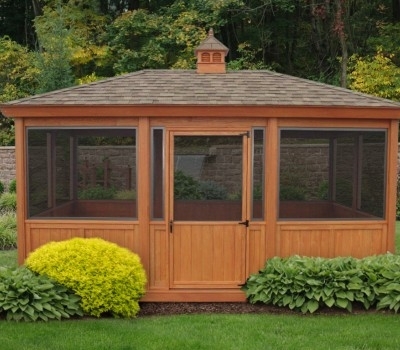 The octagon shapes start at 8′ x 8′ and goes up to 20′ x 20′, with the 12′ x 12′ size being our best seller. Rectangle size comes in 8′, 10′ and 12′ wide and up to 24′ long. 8′ x 12′, 10′ x 12′, and 12′ x 14′ are the best sellers. Oval shape comes in 8′, 10′ and 12′ wide and up to 24′ long. 10′ x 12′, 12′ x 14′, and 12′ x 16′ are great sizes.